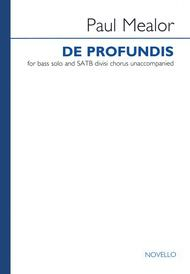 For Bass Solo and SATB Divisi Chorus Unaccompanied. Composed by Paul Mealor. Choral. Sacred. Book Only. Novello & Co Ltd. #MUSNOV293502. Published by Novello & Co Ltd. (HL.14042079). Inspired by his life-long interest in chant and choral music, Paul Mealor's De profundis pushes the boundaries of the human voice in a style synonymous with Russian orthodox music. In spring 2012 this piece sparked the 'Bass Hunter' competition - a world-wide talent search for the lowest human voice in existence. The note, an 'E' (329 Hertz), is six notes below the lowest note ever written for a choral piece (from Rachmanivov's "Vespers" - a B flat), and a whole tone lower than the Guinness World Record-holder - a sung 'F sharp'. 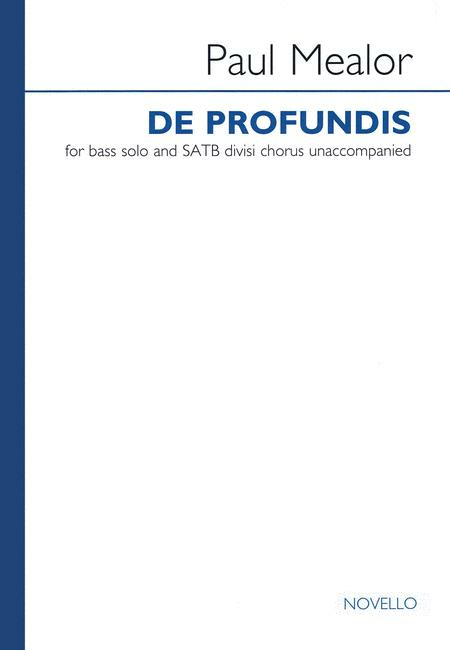 The piece has since been recorded featuring the winner of the competition, Tim Storms (Decca 3709935).Inspired by his life-long interest in chant and choral music, Paul Mealor's De profundis pushes the boundaries of the human voice in a style synonymous with Russian orthodox music. In spring 2012 this piece sparked the 'Bass Hunter' competition - a world-wide talent search for the lowest human voice in existence. The note, an 'E' (329 Hertz), is six notes below the lowest note ever written for a choral piece (from Rachmanivov's "Vespers" - a B flat), and a whole tone lower than the Guinness World Record-holder - a sung 'F sharp'. The piece has since been recorded featuring the winner of the competition, Tim Storms (Decca 3709935).